Water fills the empty spacesuit helmet of Italian astronaut Luca Parmitano in an Aug. 27, 2013 test of the faulty spacewalking gear, which forced NASA to abort a July 16 spacewalk for safety reasons. The water leak confirmation will help NASA engineers devise repair methods for the spacesuit. Astronauts on the International Space Station have recreated the scary spacesuit water leak that forced NASA to abort a spacewalk last month, paving the way for eventual spacesuit repairs. The station crew powered up a spacesuit reserved for Italian astronaut Luca Parmitano on Tuesday (Aug. 27) to see if it was still afflicted by a major water leak that flooded Parmitano's helmet with nearly 1.5 liters of water during a July 16 spacewalk. 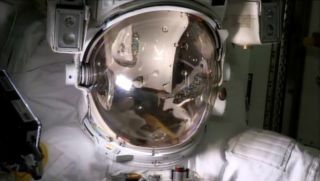 The water filled Parmitano's eyes, ears and nose, in what became a "scary situation" in orbit, NASA astronaut Chris Cassidy, who was spacewalking with Parmitano, has said. "The investigation does continue into this spacesuit on two different fronts," NASA spokesman Josh Byerly said during a NASA TV broadcast on Aug. 27. "The engineering teams are taking a look at the root cause. They're going to have the crew begin to manipulate this suit and to take some of the parts out that will be returned to Earth for investigation, but they needed to verify that this problem did exist before they do that." NASA has been investigating the leak since the July 16 spacewalk was aborted, with the space agency selecting a group of experts to serve on a mishap investigation panel to identify the leak's root cause. Cassidy and Parmitano had planned to spend about 6.5 hours working outside the space station during the July 16 spacewalk, but returned inside after just one hour and 32 minutes due to the leak. Parmitano has described the experience as similar to being a "goldfish inside a fish bowl." NASA officials on the ground decided to end the spacewalk after Parmitano reported that the water in his suit was increasing. As he was heading back inside, the water leaking into his suit continued to fill his ears, eyes and nose, making communication with Cassidy and Mission Control difficult. Once back inside the airlock, the other astronauts aboard the station helped to remove Parmitano's troubled suit and dry him off. "Space is a harsh, inhospitable frontier and we are explorers, not [colonizers]," Parmitano wrote at the end of a blog post describing his harrowing ordeal. "The skills of our engineers and the technology surrounding us make things appear simple when they are not, and perhaps we forget this sometimes. Better not to forget." Parmitano and Cassidy are two of six astronauts currently living and working onboard the International Space Station. The station's Expedition 36 crew also includes NASA's Karen Nyberg and Russian cosmonauts Fyodor Yurchikhin, Alexander Misurkin and Pavel Vinogradov.